This mod adds to the game a way to label your chests, and see their names on a hovering tooltip if you pass your mouse pointer over there, the purpose is make organizing things easier. 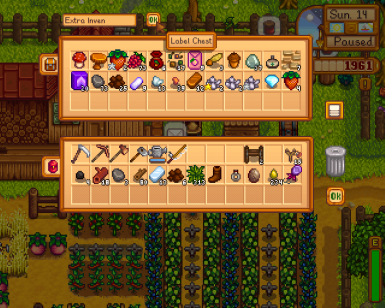 This is a fairly simple mod for the game Stardew Valley, it adds to the game a way to label your chests, and see their names on a hovering tooltip if you pass your mouse pointer over there, the purpose is make organizing things easier. Just unpack the .zip file in the mods folder. Just delete the mod files again. The chests will remain "named" though, but the tooltip won't work, if you want to undo the names, you can remove and put back down the chest, or edit the name back to "Chest" before uninstalling the mod. Moved the label again, so that it fits inside 1366x768 laptop and netbook screens. Updated to new SMAPI, and to support newer SV version. Moved label from the top of the colour menu. Updated to SMAPI 0.39.6, now it looks better when zoomed. Some changes were made to SpeederSDVUIUtils.cs, modders using it should update their mods too. The license of the project is [GPL3](https://gnu.org/licenses/gpl.html).